The Swisher 5.1HP (187cc) log splitter features a powerful Honda engine to ensure optimal performance. The splitter offers 28 Tons of splitting force. The heavy-duty 2-stage pump provides maximum splitting performance. The splitter can function in both horizontal and vertical splitting positions. The log cradles reduce the chance of the log rolling off the beam. Easily transport your splitter anywhere you want to go...it's road towable. Other features include: 25-Inch opening and a 2.5 gallon protected poly hydraulic tank. Removable log cradles helps prevent operating from reaching to ground level for split logs, vertical beam lock adds security while splitting in vertical position. 2.5 gallon poly hydraulic tank is rust resistant. Lightweight and powerful, the iON 10 inch Cordless Chain Saw with battery plus charger features a durable, self-lubricating Oregon cutting bar and chain to cut branches, limbs and logs up to 9.5 inches thick. At the heart of iON is the long-life, rechargeable EcoSharp lithium-ion battery system, for reliable performance, season after season - and no carbon emissions for cleaner air. iON starts instantly with a simple push of a button and its ultra-lightweight, ergonomic design maximizes maneuverability and user comfort during use. Safety features include: hand guard with kick-back brake function, built-in safety switch to prevent accidental starts, sturdy aluminum handle, and protective sheath for safe storage. Take a pass on gas and choose the one chainsaw that's a cut above the competition. Introducing a greener, cleaner way to maintain your yard and garden with the Sun Joe Saw Joe SWJ698E electric chainsaw. The powerful 9 Amp motor makes light work of limbs, and easily slices through branches and brush up to 9-inch thick. Quickly cut a cord of wood, collect a load of logs, or prune a pine tree with the simple push of a button. A built-in safety switch prevents accidental starting. And at just over 7 lbs., the Saw Joe is designed for maximum maneuverability around the yard or garden, without the need for gas. So, why lug a jug when you can go with a Joe. Take a pass on gas and choose the one chain saw that's a cut above the competition. Introducing a greener, cleaner way to maintain your yard and garden with the Sun Joe SWJ699E 14- inch 9-AMP ELECTRIC CHAIN SAW. The powerful 9-amp motor makes light work of limbs, and easily slices through branches and thick brush up to 10 inches thick. Quickly cut a cord of wood, collect a load of logs, or prune a pine tree with the simple push of a button. A built-in safety switch prevents accidental starting. And at just over 7.7 lb.s., the SWJ699E is designed for maximum maneuverability around the yard or garden, without the need for gas. So, why lug a jug when you can go with a JOE? Shape up your yard with Sun Joe's GTS4002C 3-in-1 24V cordless yard care solution. GTS4002C features three adjustable and interchangeable tool heads and a 5.3-ft extension pole to quickly convert from powerful pole saw, to handy pole hedge trimmer, to string trimmer. SUN JOEs cordless yard garden multi-tool system lets you do the work of a crew to tackle everything from trimming your tallest hedges, to sawing overhead limbs and logs, and trimming your turf with ease. Just grab the battery pack and go! Do more, in less time-cut high, trim low, edge farther with each pass for perfectly sheared shrubs, precisely trimmed trees, bushes and branches and grass. Swap tools in seconds and switch from the multi-angle 8-inch saw, to the adjustable 17.7-in hedge trimmer, or 10-in string trimmer/edger. SUN JOEs innovative, lightweight 24-V battery pack recharges in about an hour. Perfectly portable, its always ready to go when you are, and is ideal for use anywhere power is at a premium. 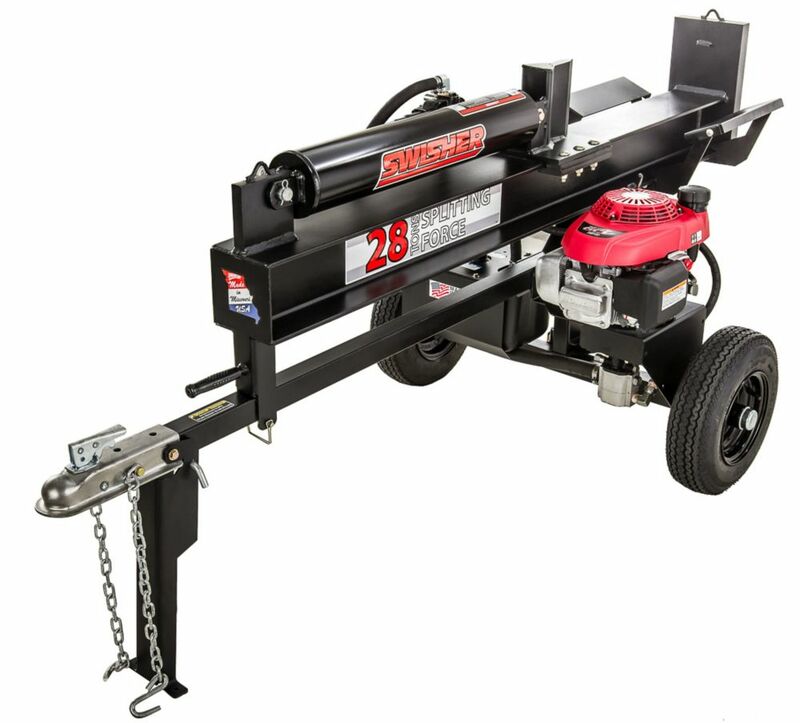 28 Ton Direct Drive Log Splitter with 5.1 HP Honda Power The Swisher 5.1HP (187cc) log splitter features a powerful Honda engine to ensure optimal performance. The splitter offers 28 Tons of splitting force. The heavy-duty 2-stage pump provides maximum splitting performance. The splitter can function in both horizontal and vertical splitting positions. The log cradles reduce the chance of the log rolling off the beam. Easily transport your splitter anywhere you want to go...it's road towable. Other features include: 25-Inch opening and a 2.5 gallon protected poly hydraulic tank. 28 Ton Direct Drive Log Splitter with 5.1 HP Honda Power is rated 1.0 out of 5 by 1. Rated 1 out of 5 by Victor from I was not impressed with the product at all. The... I was not impressed with the product at all. The design was poorly thought out and executed. Parts would not fit together correctly and it was short a lot of nuts and bolts and the ones they sent were the wrong sizes. It has a plastic hydraulic tank that would have been O.K. for milk or juice but not for hot hydraulic fluid and last but not least the exhaust was positioned so that it hit the hydraulic fluid return line not only super heating the fluid but would eventually melt the line. The positioning of the exhaust hitting the return line also made it unbearable for the operator. I bought this log splitter because it was american made and had a quality Honda motor. Maybe american know how isn't what it used to be.